Junior Pre-School Program | Kindertots Children Centre Inc. This program is a start to the Pre-School Readiness Program and it’s for children aged 3 years. The maximum group size for 3 year olds is 14 with 2 Educators in the room. In this program children start their prep for school and really get into letter and number recognition, name recognition, shapes and colors, and concepts such as big/little and up/down. 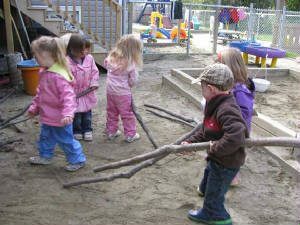 They work on fine motor skills such as printing and cutting and gross motor skills are developed through outdoor activities. All learned through play and based on what the children want to learn about. Educators interact with the children through small and large group activities and find out what the children are interested in and base all their learning on that. Children are more enthusiastic about learning when it’s what they like and based on their interests.